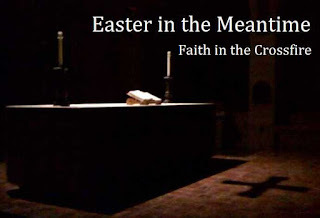 Reflections on Faith and Culture: New Weblog Bannner? In the immediately prior post I explained the new banner icon for this weblog, but I remain uncertain as to which of the images below to use. Perhaps you can help me decide. Below these images is link which you can use to let me know which you prefer. I'm grateful to you for your help. This is, after all, a collaborative effort. Go here to express your opinion. A Cornerstone Forum newsletter will go out later today with several news items of interest, including a link to this same survey. If you are not on our email newsletter list, I hope you will sign up by putting your email address in the link at the upper right. Isn't this the main alter at St. Jospeh Abbey? You're right, Michael. It is St. Joseph's Abbey. It's not far from my house, which is why I live here in Massachusetts. The monastery is a real blessing. When I first looked at the two pictures I was drawn immediately to the chapel. I felt a longing that was palpable but the longer I stayed the less comfort I felt. A kind of sense that I don't belong here, I'm trespassing and if someone comes in I will need to be very quiet and leave as soon as decorum would allow. The Caravaggio picture struck me with great power and its energy was familiar. Here is captured what my friend Gil Costello has been writing about with such passion: the possessive ontology. This is a picture of grabbing, possessing, all hands and arms mixed together reaching to take what is not theirs. The gold coins dropping from one hand, perhaps just dropping to the ground lost in the frenzy of violence (I can imagine Peter just out of sight with a bloody sword in his hand). The soldiers are there in the name of the law, which is in service to order and peace (but none of that will be found here except in His hands that are both peace and order). 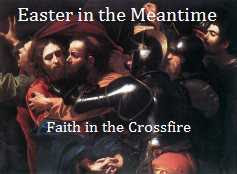 The name given this picture on the Caravaggio web page is "Taking Christ". I think that sums things up very well. I voted for "Taking Christ", mostly because I am more familiar with its themes, timely as they are.